There's no doubt about the fact that MTV Splitsvilla 11 is one of the most talked about and popular show amongst the youngsters. The show is hosted by Bollywood actress Sunny Leone along with Ranvijay Singha who play a crucial role in the show by making the pairs and letting them play some really interesting and spicy tasks that helps in strengthing the bond between the couples. In the show, a lot of contestants from different walks of life participate and in this season popular Kannada actress, Samyuktha Hegde participated who made debut in the industry through ‘Kirik Party’ that became a huge hit in the industry. Not just this, before Splitsvilla, she even participated in the 15th Season of MTV Roadies and Bigg Boss 5 of Kannada where she managed to gain a lot of limelight. In Splitsvilla 11, she made her entry as a wildcard contestant and created a lot of controversies that obviously contributed in making the show interesting. 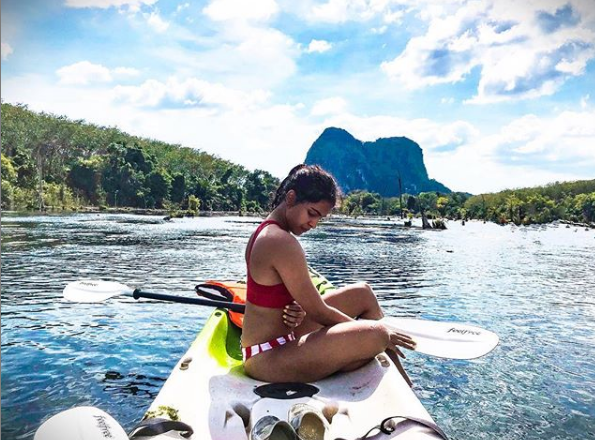 Recently, the actress is spreading fire on the internet through her vacation pictures from Thailand that she has uploaded on her Instagram account. Even in the reality show Bigg Boss, she was one of the most controversial contestant as she was involved in assaulting Sameer Acharya saying that he touched her inappropriately during the task and she said that she has in her life faced a lot of physical abuse and therefore does not want to face anymore and so demanded justice from Bigg Boss. What do you have to say about her pictures? Let us know and stay tuned for more.